^ Rand Dyck (2011). Canadian Politics. Cengage Learning. p. 88. ISBN 978-0-17-650343-7. Archived from the original on 12 April 2016. ^ Stephen L. Newman (2012). Constitutional Politics in Canada and the United States. SUNY Press. p. 203. ISBN 978-0-7914-8584-2. Archived from the original on 12 April 2016. ^ Shibao Guo; Lloyd Wong (2015). Revisiting Multiculturalism in Canada: Theories, Policies and Debates. University of Calgary. p. 317. ISBN 978-94-6300-208-0. Archived from the original on 13 April 2016. ^ "A literature review of Public Opinion Research on Canadian attitudes towards multiculturalism and immigration, 2006–2009". 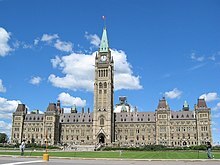 Government of Canada. 2011. Archived from the original on 22 December 2015. Retrieved 18 December 2015. ^ "Focus Canada (Final Report)" (PDF). The Environics Institute. Queen's University. 2010. p. 4 (PDF page 8). Archived (PDF) from the original on 4 February 2016. Retrieved 12 December 2015. ^ John Dixon; Robert P. Scheurell (17 March 2016). Social Welfare in Developed Market Countries. Routledge. p. 48. ISBN 978-1-317-36677-5. Dawson, R. MacGregor; Dawson, W. F. (1989). Ward, Norman (ed.). Democratic Government in Canada. Toronto: University of Toronto Press. ISBN 978-0-8020-6703-6. Retrieved 14 January 2011.